WASHINGTON, D.C. -- Sixty-seven percent of Democrats say they are "extremely" or "very" proud to be Americans, down 11 percentage points from a year ago. Republicans (92%) and independents (73%) are about as likely now as in 2016 to express such patriotic sentiments. These results are based on a March 9-29 Gallup poll, which updated the Gallup trend question first asked in January 2001. 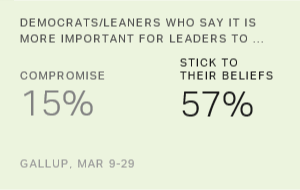 The percentage of Democrats saying they are proud is the lowest Gallup has measured to date, falling below the previous low of 74% recorded in January 2007. That survey was conducted when Republican President George W. Bush had a 36% job approval rating and just after he announced a "surge" in U.S. troops to Iraq to attempt to turn around U.S. fortunes in the increasingly unpopular war. The decline in Democratic pride this year most likely stems from Democrats' negative feelings about President Donald Trump; fewer than 10% of Democrats approve of the job Trump is doing. In addition to the 67% of Democrats who are extremely (43%) or very (24%) proud to be Americans, 18% say they are "moderately proud," 9% are "only a little proud" and 5% are "not at all proud." The combined 14% of Democrats who express little or no pride is up from 6% last year. Republicans' pride remains high at 92%, close to the average 94% Gallup has measured for the group since 2001. Republicans usually rank among the subgroups expressing the most pride. Independents' current level of pride is six points lower than their historical average of 79%. The current 25-point gap in patriotic feelings between Republicans and Democrats is the highest in Gallup's records. In January 2007, the party gap was 21 points. The drop in Democratic pride has caused the percentage of Americans overall who are extremely or very proud to fall to a new low of 75%, down from the prior low of 81% last recorded in 2016. Eighty-one percent of Americans were also proud in 2015 and 2007. The high points in pride came in the years just after 9/11, when more than nine in 10 Americans were proud. Overall, 51% of U.S. adults currently say they are "extremely" proud to be Americans, and 24% are "very" proud. The decrease has disproportionately come from the latter category; a year ago, 52% said they were extremely proud and 29% were very proud. The percentage of U.S. adults who are "only a little" or "not at all" proud has increased from 6% to 9%. Political considerations color a wide range of attitudes, including some that do not have an obvious political connection. For example, Gallup recently documented changes in Republicans' and Democrats' ratings of their personal finances since the election, as well as a sharp uptick in the percentage of Democrats who report experiencing a lot of worry in their daily lives. Americans' pride in their country is another area that politics can affect. 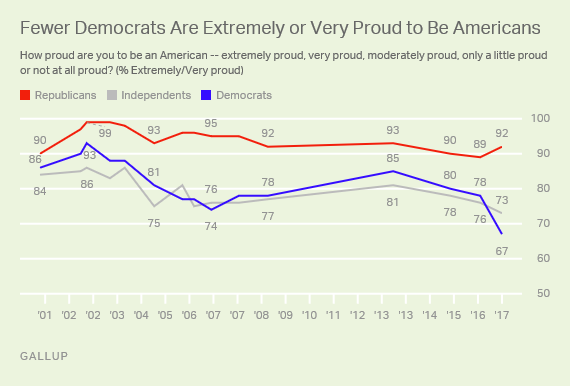 Though most U.S. adults, including the majority of Democrats, say they are proud to be Americans, fewer Democrats express this sentiment now than at any point in the past 16 years. Trump is likely the major factor behind Democrats' diminished patriotism. Democrats held highly negative opinions of Trump throughout the 2016 presidential campaign, and their views are no better now that he is commander in chief. In addition to their negative feelings about Trump, Democrats' pride in their country may also be affected by their perceptions of how other countries view the U.S. In February, just four in 10 Americans, including 31% of Democrats, said they believe the rest of the world views the U.S. favorably, the worst in Gallup's annual measurement since the latter stages of the Iraq War. Historically, Democrats' patriotism appears to have been susceptible to considerations such as which party occupies the White House and how the U.S. is faring internationally, while Republicans' patriotism has been more consistent over time. Therefore, for U.S. pride to bounce back to where it has been in the past, renewed feelings of patriotism among Democrats will be necessary. For results based on the total sample of 401 Republicans, the margin of sampling error is ±6 percentage points at the 95% confidence level. For results based on the total sample of 610 independents, the margin of sampling error is ±5 percentage points at the 95% confidence level. For results based on the total sample of 465 Democrats, the margin of sampling error is ±5 percentage points at the 95% confidence level. Since falling below 40% in record time, Donald Trump's job approval rating has descended to the lowest level of any first-year president in Gallup's polling history. There are some precedents, however, for recovery. White males without college degrees give Donald Trump his highest job approval ratings among major subgroups, while blacks and nonwhite women give him his lowest ratings.